Students in classrooms of team teachers led by “multi-classroom leaders” showed sizeable academic gains, according to a new study from the American Institutes for Research and the Brookings Institution. 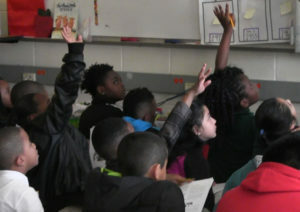 Students respond to a multi-classroom leader’s question in a classroom in Charlotte-Mecklenburg Schools. The team teachers were, on average, at the 50th percentile in the student learning gains they produced before joining a team led by a multi-classroom leader. After joining the teams, they produced learning gains equivalent to those of teachers in the top quartile in math and nearly that in reading, said the report, released on January 11, 2018, through the CALDER Center. The gains the study attributes to team teachers are equivalent to those of teachers from the 75th to 85th percentile in math, and, in six of the seven statistical models, from 66th to 72nd percentile in reading. These results show that students can consistently experience top-quartile teaching in math, and teaching nearly that good in reading, if schools place excellent teachers in charge of small teams of typical teachers. What is an Opportunity Culture? In each Opportunity Culture school, a team of teachers and administrators adopts new roles to reach more students with teachers who have produced high-growth student learning. Multi-classroom leaders lead a teaching team, providing guidance and frequent on-the-job coaching while continuing to teach, often by leading small-group instruction. Accountable for the results of all students in the team, they also earn supplements averaging 20 percent (and up to 50 percent) of teacher pay, within the regular school budget. The schools redesign schedules to provide additional school-day time for teacher planning, coaching and collaboration. The national Opportunity Culture initiative now includes more than 160 schools in about 20 districts in nine states. The MCL model has the potential to make the longstanding Opportunity Culture vision possible—to reach 100 percent of students with excellent teaching. Study authors Ben Backes of American Institutes for Research (AIR) and Michael Hansen of Brookings used rigorous econometric methods to study student growth in Opportunity Culture schools. The study compared student growth in classrooms led by teachers in Opportunity Culture roles to student growth in non-Opportunity Culture classrooms in both the same schools and in different schools, controlling for various factors including student background and prior performance. The study covered about 15,000 students and about 300 teachers, looking at three years of data for Charlotte-Mecklenburg Schools and two years for Cabarrus County Schools, both in North Carolina, and two years for the Syracuse (N.Y.) City School District. About 90 percent of the students included were in Charlotte-Mecklenburg. In these three districts in 2015–16, 74 percent of Opportunity Culture schools were eligible for Title I based on the percentage of low-income students. Bryan C. Hassel, co-president of Public Impact, which founded the Opportunity Culture initiative, noted that key to understanding the results is that schools selected excellent teachers for multi-classroom leader (MCL) roles, and put them in charge of small teams. The researchers found that among MCLs whose teaching effectiveness could be quantified through student learning growth data, all were in the top quartile of effectiveness before being selected as MCLs. In 2015–16, MCLs led a median of five team teachers each, and 42 percent had teams of four or fewer, in schools providing team-size data to Public Impact. Students’ math gains were statistically significant in all seven of the researchers’ statistical models. Reading gains were statistically significant in six of the seven models. The seventh, comparing classrooms within schools that did and did not have an MCL, showed no statistically significant impact, because reading improved in both types of classrooms after multi-classroom leaders began leading some of the teachers in each school. The researchers’ findings indicate that gains in Opportunity Culture classrooms were substantially higher than those in schools with no Opportunity Culture roles, and in Opportunity Culture schools prior to the implementation of these roles. Within Opportunity Culture schools, differences were smaller between classrooms that did or did not have Opportunity Culture educators. Most schools implement the roles gradually, allowing in-school comparisons. The researchers acknowledge that these smaller differences could indicate positive “spillover” effects. Public Impact sees several possible sources of spillover effects. For example, some strong teachers who applied for but did not get Opportunity Culture roles took other teaching jobs in the Charlotte schools, in hopes of moving into future Opportunity Culture positions. And the Charlotte superintendent who first used Opportunity Culture quickly announced his plans to expand it to half of the district’s schools; local media repeated his message. “Opportunity Culture teachers are showing how much they can achieve when they get the right support. We will investigate and share how top MCLs in each subject helped their teams—and other teachers—achieve strong outcomes,” Emily Hassel said. In some Opportunity Culture schools, excellent teachers reached more students directly, rather than leading a team. The researchers’ findings were mixed for these teachers, some of whom used extra online learning (“blended-learning teachers”) and some of whom did not (“expanded-impact teachers”). Effects for expanded-impact teachers were positive and in the same range as those for MCLs’ team teachers, but were statistically significant in only half of the researchers’ models. The effects for blended-learning teachers were mixed, generally not statistically significant, and negative in some reading models. “This suggests these teaching roles should be embedded in MCL teams,” said Lucy Steiner, who leads Public Impact’s work with districts and schools. Public Impact leaders note that districts must work to maintain results as they scale up Opportunity Culture, keeping a tight focus on the principles of an Opportunity Culture and other key lessons from the first districts to implement it. Read more: See the researchers’ blog post about the study.